2018’s end saw the publication of the Northern Ireland Audit Office’s General Report on the Health and Social Care Sector. agendaNi assesses the findings of the report, which concern financial and operational performance in the context of “very tight financial constraints”. The latest General Report on the Health and Social Care Sector encompasses the years 2015-16 and 2016-17 and reviews developments across four core areas within the health and social care (HSC) sector, including the financial performance of the HSC Trusts; time access to hospital care and performance against waiting time targets; the implentation of the Business Services Transformation Programme (BSTP); and payments to consultants in line with the Waiting List Initiative. In its review of the financial performance of the sector, the report focuses on the work of the five main HSC Trusts, which include Belfast, Northern, South Eastern, Southern and Western Health and Social Care Trusts. The report states that all trusts recorded a surplus in 2015-16 and 2016-17, in line with departmental requirement. 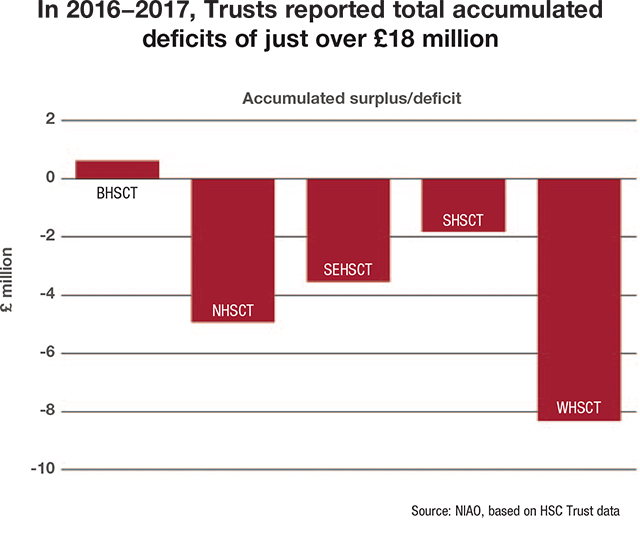 Despite the enforcement and achievement of this policy, it is highlighted that the trusts have accumulated a total cumulative deficit of over £18 million since their establishment in 2007. The authors of the report argue that the current method of financial reporting “does not accurately capture the underlying financial position and pressures facing the trusts”. The report makes the claim that the bodies have only been able to maintain surpluses by implementing a series of spending cuts on a system already highlighted as facing considerable strain, with permanent secretary Richard Pengelly claiming that rising pressures are “outstripping” the Department of Health’s capacity to meet demand. Such measures to achieve a financial surplus have included a series of annual nonrecurrent efficiency savings across the HSC budget, consequences of which have been reflected in increased waiting times. Despite such actions, the report notes that “other savings would have been unavoidably implemented to ensure breakeven” had the Department not received additional in-year monitoring funding of £173 million during the period 2015-16 and 2016-17. The escalating financial pressures facing the HSC Trusts are highlighted within the context of the system facing “mounting pressures”. The cost of maintaining existing service models is highlighted as “continuing to increase at a pace which cannot be sustained within available budgets”, with the consequence that “difficult choices have to be made”. Financial pressures are encapsulated in purely numeric terms of £160 million: a figure noted as representing an increase of approximately £45 million from the estimated sum of £115 million in 2014-15. That figure is highlighted as one separate and significantly lower to that of the total HSC sector funding gap, which “fully reflects inflationary and demographic pressures, the need to transform service delivery and build capacity to meet population need”. In response to the serious and rapidly escalating financial situation facing the Department of Health, the NIAO recommends the following of a twofold approach. According to the publication, such an approach would entail a review of current annual arrangements including longer term financial planning and commission of services, highlighted as a measure which could move trusts away from the “firefighting” of short-term pressures, whilst assisting them in developing longer-term and “better value for money” solutions. 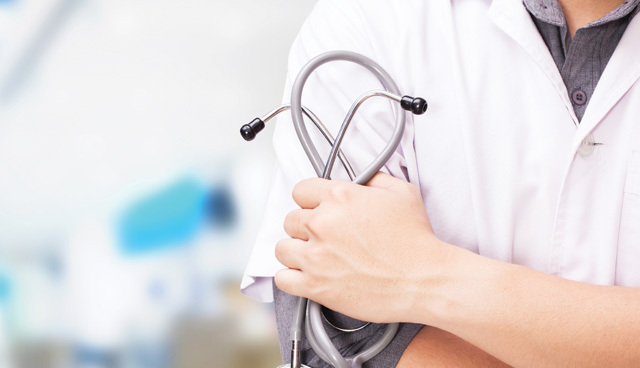 The second strand of the NIAO’s recommended approach suggests improving local health and social care needs assessments to provide a robust baseline for informing future commissioning and funding allocations. The NIAO report’s focus on operational performance within the HSC sector highlights timely access to hospital care in a system where “waiting times have grown”: a fact the document attributes to a range of factors including the increasing and older population, higher patient expectations, improvements in technology and a wider range of available procedures. Criticism surrounds the failure of HSC Trusts to achieve waiting time targets for outpatient care, accident and emergency treatment and cancer treatment, despite the lowering of waiting time targets for inpatient and outpatient care “to take account of increased demands and the acknowledged capacity gap”. It is similarly highlighted that only part of the inpatient care target and each of the cancer targets were met at individual trust level, with a further decline in performance against the 62-day cancer care target described as “concerning”. Improvements are outlined in respect of the 14-day target for breast cancer referrals; however, the overall target has not been achieved. Significantly, it is claimed by the report that Trusts clearly do not have the capacity” to meet increasing demands, particularly within the context of “uncertainty over future funding. “Trusts will continue to struggle to meet future waiting time targets,” reads the document. The report also places the introduction of the Business Services Transformation Programme (BSTP) under scrutiny. Aimed at introducing shared services across four service areas and 16 HSC user organisations, it was initially estimated that BSTP would secure efficiency savings of almost £125 million over a 10-year period. However, the programme’s implementation saw “significant difficulties”, including a £10 million cost increase; delays in the implementation of the Human Resources, Payroll, Travel and Subsistence (HRPTS) system; and difficulties in correcting staff overpayments. One notable example saw one HSC staff member overpaid by more than £43,000 over three years. Far from the initial projection, the report notes that the introduction of BSTP had achieved savings of £48.8 million at the end of 2016-17 and is currently projected to achieve savings of £99.4 million by 2021. The report issues the critical recommendation that lessons learnt in the implementation of BSTP “are more widely disseminated across the public sector for the delivery of future shared service projects”. The report highlights that trusts have been allocated non-recurrent funding each year to undertake additional activity to reduce waiting lists, utilising that funding to “maximise in-house capacity in the first instance by setting up additional evening and weekend clinics”, commonly referred to as Waiting List Initiative (WLI) activity. Such activity has led to a review of payments made by the Southern Trust which identified that the trust entered into an agreement with consultants which resulted in the trust paying for working time of almost £247,000, “which had no impact on waiting lists”. The report concludes with calls for “successful transformation of service delivery models which can help the system adapt to increasing patient demand and funding constraints”. Such transformative measures are detailed in the ‘Delivering Together’ document, which outlines the path towards a new service model that would ensure “greater investment in prevention, early intervention and primary care, and reconfiguration of hospital and community services, appropriately resourced to deliver high quality care, with specialist acute services delivered from fewer sites”. The delivery of a successful vision, according to the report, “will require new ways of working, including with partners outside of HSC Trusts” in order to move away from the present situation “which cannot be sustained”.